It recently occurred to me that I haven’t really done any posts yet on just a location that I really like. I’ve liked a lot of towns and cities I’ve been to so far but Northampton really caught me off guard. And hey, ya gotta start somewhere. So, here we are. My first post that’s less restaurant focused and more locale focused. I arrived in Northampton only a few hours before one of the rare 2012 seasonal snow storms drifted in. The timing was actually quite brilliant because I quickly learned that this beautiful little college town looks stunning when covered in dreamy white crystallized water. 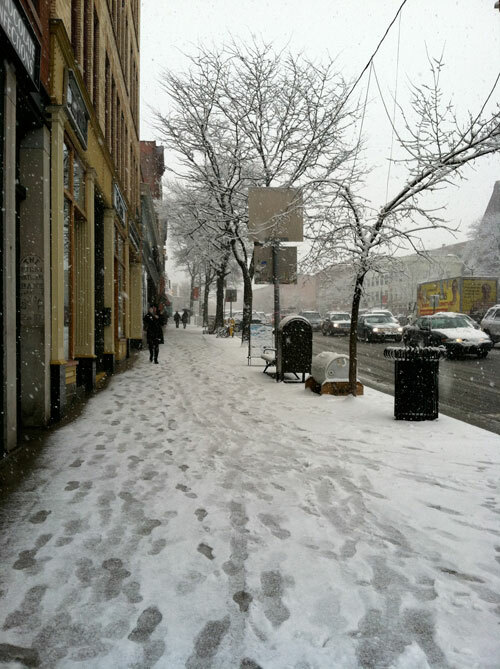 Snow tends to make me feel all warm and romance-y as it is. Add in an über vegan-friendly environment and I’m basically in heaven. Upon arrival I was planning to immediately hit up one of the most famous all-vegan joints in the area, Karma Restaurant. Unfortunately I didn’t realize that they were currently closed as they’re moving to a new location (again, dear restaurant owners, please oh please keep your website and/or social media content up to date). 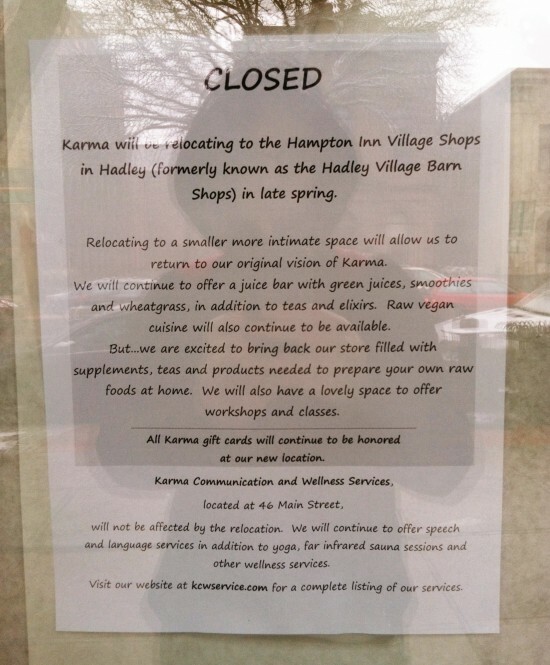 Karma has since added a note on their website about the move. Anywho, I parked around the corner, walked over and was totally bummed to see they were closed until the Spring. 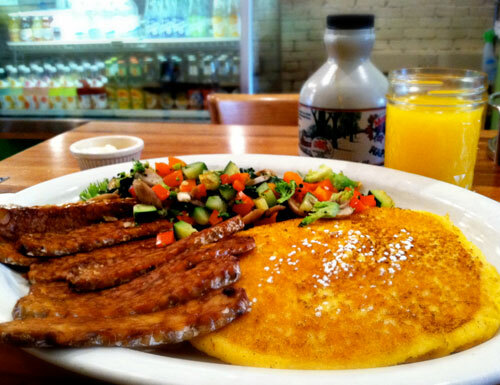 They’ve got unlimited, open, free wifi, freshly pressed juice (come to mama! ), vegan snacks (tofu scrambles, cookies, explicitly vegan hot chocolate and mochas), and boat loads of seating. They’ve got two levels, the wifi works great on both. Some corners are private and cozy or you can sit in an area that’s more open and you might sit next to folks you don’t know. They’ve also got full on meals (vegan options included, of course), and are open from at least 8AM to 10PM every single day. This is a work-from-laptop-ers dream come true. And if that’s not enough it’s within walking distance to a few other vegan-friendly eaters including Bela Vegetarian, Butterfly, Paul & Elizabeth’s and The Green Bean. 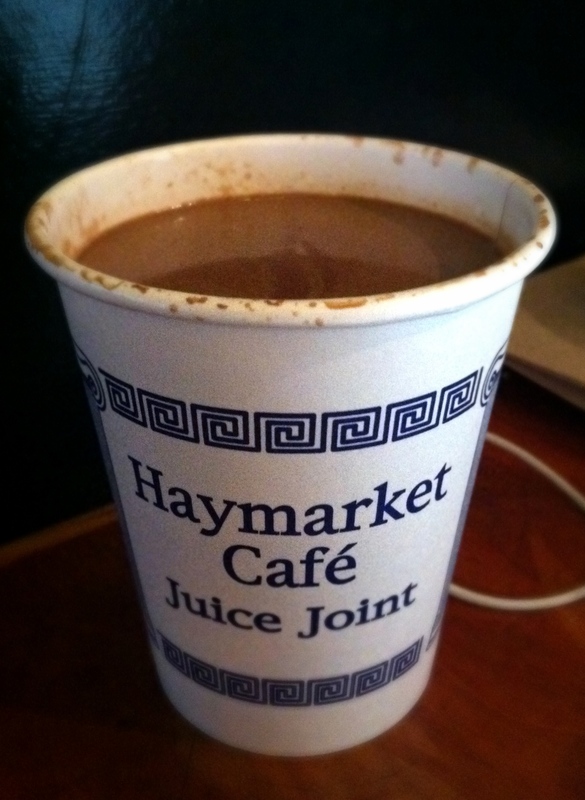 The best vegan hot chocolate I’ve ever had. And that includes homemade! THE best! I was so overjoyed by discovering Haymarket Café that I sat there most of the day…which resulted in forgetting to check on Gerty as she was in a metered parking space. First parking violation ticket of the trip: check! 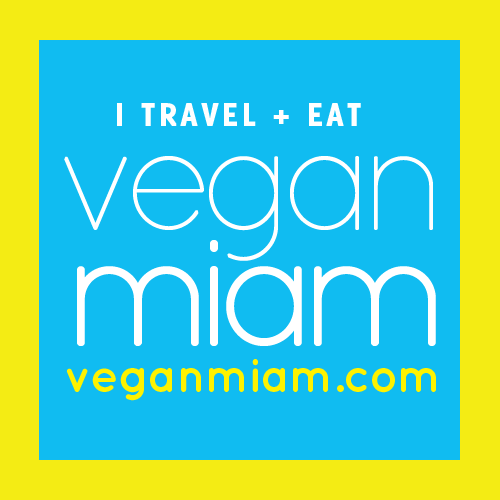 As I’m focused on vegan restaurants I did not get to sample all of the vegan-friendly restaurants in the area. 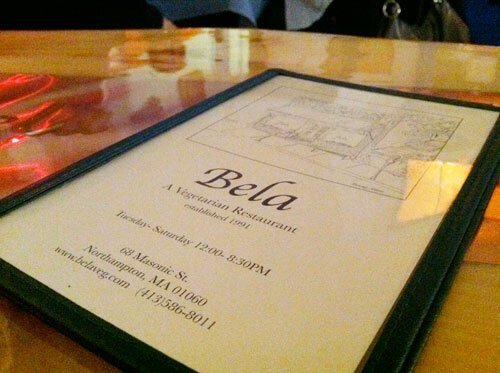 However, I did have brunch one morning at The Green Bean as well as dinner at Bela Vegetarian (pics below). Brunch at The Green Bean -Tempeh, Arizona: grilled tempeh marinated in tamari sauce and sesame oil. Served with a side of steamed mixed vegetables and vegan corn pancakes. It was very, very good. I don’t know why but I went in not expecting much but I was pleasantly surprised. Not only that but the servers know vegan lingo. “Here is your side of Earth Balance butter.” Oh, why thank you, friendly server, Lady. 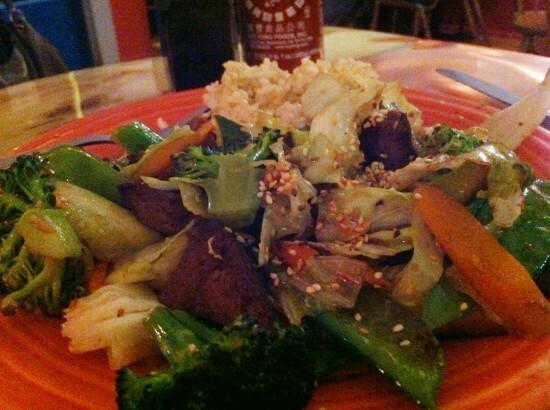 Dinner at Bela Vegetarian – Vegetable Medley: steamed, mixed vegetables stir-fried in soybean sauce, lemon juice, and sesame oil glaze with brown rice and seitan bits. I really enjoyed this dish. It was simple but exactly what I was looking for. And very filling. It was really just a lovely experience over all, and it was only over 2.5 days! If you get a chance to visit Northampton, do take it! Special thanks to Alec and Kathryn for letting me sleep two nights in their spare bedroom — and to Adam for connecting us all together! 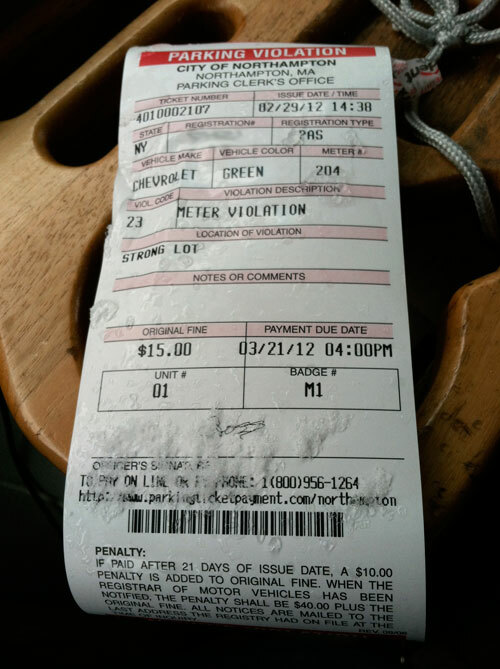 Only $15 for a parking ticket?! Lucky! If that happened in the ‘ville you’d be dropping at least 50 bucks. Haha.. I know, I know. It really wasn’t that bad. ;) But it was also something like $2.00 an hour to park. Which I think is a lot if you’re going to be hanging out in one place all day. If you park on the street, where the parking is limited to a couple of hours, it’s more expensive. But there are long-term lots and a parking garage where it’s much cheaper (the first hour is free in the garage, and after that it’s 50 cents an hour. So come on back and save some of your parking money for more treats! Northampton is my realto favorite vegan-friendly local-ish vacation spot. Green Bean is so fun to hang out at, especially with their bottomless coffee! Oops, I posted from my phone and an extra word snuck in! Well, you must come back, because you missed (I’m wondering how?!?!) the *best* exclusively vegan restaurant in western Massachusetts, Cafe Evolution!!! Free wifi, super scrumptious meals as well as quite a fantastic “treat” case with cupcakes, brownies and blondies. Such a chill, relaxed vibe. It may be listed as being in Florence, MA but its right on the line (us locals say its in Noho) and not far from downtown at all. Next time! Glad you enjoyed charming Northampton! Cafe Esselon is great too, with my fave vegan brekkie and stellar cappucinos/lattes! FYI- Florence is a village within Northampton, MA. It has its own postal code, but it is still Northampton. A lot of cities and towns around here are like that, for example, the neighboring Williamsburg town hall is in Haydenville, a different postal code than Williamsburg.